SEOUL, South Korea — Washington and Seoul on Sunday signed an agreement on how to share the cost of the American military presence in South Korea, resolving a dispute between the allies before President Trump’s meeting this month with Kim Jong-un, the North Korean leader. But the one-year deal only temporarily addresses an issue that has become particularly contentious under Mr. Trump, who has insisted that South Korea and other allies shoulder more of the cost of maintaining American bases on their soil. Under the new deal, Seoul will contribute about 1.04 trillion won, or $ 925 million, this year to help cover the expense of stationing 28,500 American troops in South Korea. That is an 8.2 percent increase from last year, when South Korea paid 960 billion won, roughly half the total cost. The agreement, subject to parliamentary approval, was signed in Seoul on Sunday by the chief South Korean negotiator, Chang Won-sam, and his American counterpart, Timothy Betts. During the negotiations, “the United States reconfirmed its commitment to defending South Korea and made it clear that it was not considering any change in the size of American military presence,” the South Korean Foreign Ministry said in a statement. The statement also said Washington had withdrawn its earlier demand that South Korea provide “operational support,” helping to pay the costs of the American soldiers, aircraft carriers and war planes used in joint military exercises with the South. Unlike the previous five-year deal, which expired on Dec. 31, the new agreement will cover this year only. 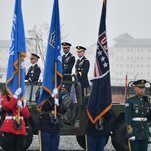 The allies will have to resume negotiations within months over how to share next year’s costs, giving the United States a chance to press for a far bigger South Korean contribution. Such talks have always been contentious, but particularly so in the past year. Negotiations to replace the old agreement went past their December deadline, as South Korea resisted Washington’s demand that it raise its contribution by 50 percent. The deadlock had raised fears that Mr. Trump might propose a withdrawal or reduction of American troops in South Korea as a bargaining chip during his second summit meeting with Mr. Kim, which is set to take place Feb. 27-28 in Hanoi, Vietnam. North Korea has long campaigned for the troops’ withdrawal, arguing that the American military threat had forced it to develop nuclear weapons. At the Vietnam meeting, Mr. Trump is hoping for concrete and verifiable progress toward denuclearizing North Korea. The 8.2 percent increase falls far short of Mr. Trump’s demand, but it is still a major concession for Seoul. When South Korea signed its last cost-sharing deal in 2014, it agreed to a 5.8 percent increase over 2013. Under that deal, South Korea’s contribution increased only 1 percent each year from 2015 to 2018, in keeping with domestic inflation rates. South Korea had also wanted another multiyear deal, to avoid having to negotiate every year. Still, the new one-year deal helps alleviate, even if briefly, concern that Mr. Trump might put the future of American troops in South Korea on the table in the talks with Mr. Kim. Mr. Trump has often questioned the value of stationing American troops abroad, repeatedly demanding that South Korea and Japan pay more for the defense they provide. In an interview aired on CBS News last Sunday, Mr. Trump again complained that keeping American troops in South Korea was “very expensive” but said he had no plans to bring them home. But South Koreans are well aware of Mr. Trump’s unpredictability. After the June meeting, Mr. Trump boasted that he had “largely solved” the North Korean nuclear crisis. But talks have since stalled over how to implement the Singapore agreement. The South’s president, Moon Jae-in, has stressed the importance of the military alliance with Washington, insisting that its fate should not be up for discussion in the talks between the North and the United States. In recent weeks, conservative South Korean commentators have said it is worth paying more for American troops to keep Mr. Trump from withdrawing them. But progressives, including members of Mr. Moon’s governing party, are sensitive to any impression that the Americans are bullying their country. “Trump is not the United States,” Bae Myung-bok, a senior columnist for the daily JoongAng Ilbo, wrote last month, urging South Korea not to give in to Washington’s demands. The United States military command was established in 1957, when South Korea was a largely agrarian country. As it transformed into a global trading power, South Korea’s contribution to covering the cost of American troops has increased along with its defense budget. Not counted as part of South Korea’s contribution to the shared defense costs are large tracts of land that it supplies rent-free for American military bases. South Korea has also taken on more than 90 percent of the $ 11 billion cost of expanding Camp Humphreys, south of Seoul, into the largest American military base outside the continental United States. South Korea is also one of the biggest buyers of American weapons. It spends 2.5 percent of its gross domestic product on defense, more than any European ally of the United States. Tags: Costs, Deal, Defense, Korea, Shared, Sign, South, U.S.
‘Lookout’ drone helps smugglers sneak illegal immigrants into U.S.